I’m excited to share this nursery with you. I think that it really shows what a fun space can come from using primarily one color. 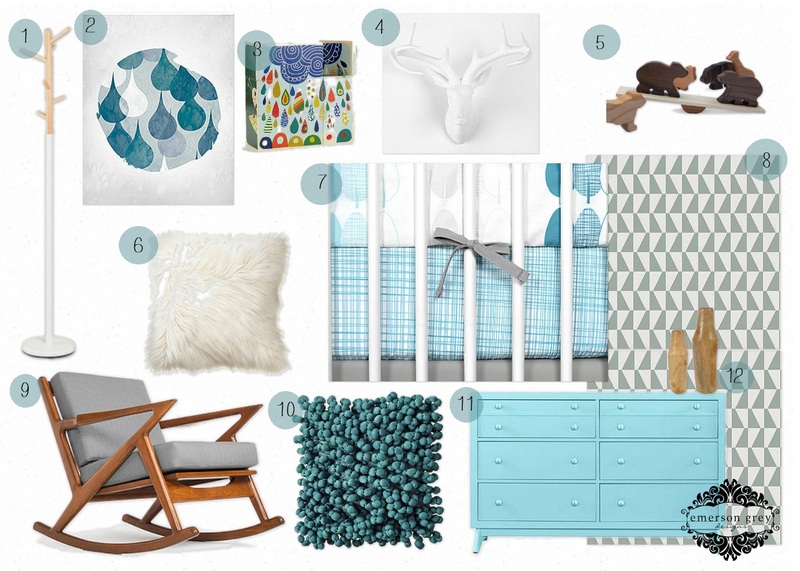 All different shades of blue are in this nursery. Some light, some deep…all working together to create a cool feeling room for a little guy. Little touches of wood tones add a bit of warmth throughout the space adding just the right balance. I love the wood animals on the seesaw, I think they would add such a fun touch to a shelf or bookcase. My inspiration for the colors of the room came from the Olli & Lime Forrest 4pc bedding set. Olli & Lime makes adorable, modern crib linens and art pieces. The modern triangle wallpaper by Borastapeter makes such a great backdrop for the aqua dresser/changing station. Be sure to visit each link below…the possibilities from all these companies are endless. Enjoy!